Posted on 19 July 2016. THE Electoral Commission of Zambia (ECZ) has rubbished claims by Hakainde Hichilema that the Commission is plotting to cancel the August 11th general elections to allegedly keep President Edgar Lungu in power. The Commission has stated that next month’s general elections will go ahead as scheduled and claims of the Commission planning to cancel or postpone the polls by the United Party for National Development (UPND) were baseless and unmerited. ECZ public relations manager Cris Akufuna said the Commission had no power to either suspend the general elections or even cancel the polls and that it was not the intention of the electoral body to postpone the polls to sustain President Lungu to continue in power. Mr Akufuna has challenged Mr Hichilema who is the UPND presidential candidate to provide proof of how and when the ECZ was going to either postpone or cancel the general elections. He said ECZ had made a lot of progress in preparing for the general elections next month and that its programme was going according to plan and schedule. Mr Akufuna said the claims and accusations were only meant to divert the attention of the Commission from effectively and fairly presiding over the electoral process. 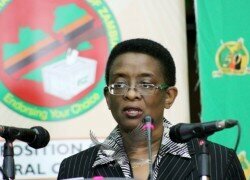 “As a matter of fact, we do not have the power to postpone or cancel the general elections. The elections will go ahead as scheduled and claims and allegations that the Commission is planning to cancel the polls have no basis. By law, the ECZ has no powers to cancel the elections and you challenge those claiming that the elections will be cancelled to state how this can be possible. We have the mandate to preside over the electoral process and those accusations are meant to divert our attention from effectively executing our mandate,” Mr Akufuna said. Mr Akufuna said the UPND fears of the elections being cancelled were unfounded adding that the claims could be part of the opposition party to deflect Zambians from real issues. Mr Hichilema while addressing a rally in Chilanga on Friday claimed that the ECZ was planning to defer the August general elections in order to sustain President Lungu’s stay in power. The UPND leader also claimed that the ECZ presidential candidates meeting whose agenda was to end violence was an attempt for the Commission to announce the cancelation of the elections. Mr Hichilema claimed that President Lungu had realised that the Patriotic Front (PF) would not be able to win the general and would therefore want elections to be postponed so that he could stay in power a little longer.